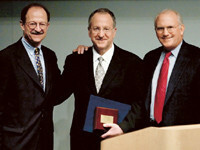 Memorial Sloan Kettering President Harold Varmus, Cornell University President David Skorton, and Memorial Sloan Kettering Board Chairman Douglas Warner at the Academic Convocation ceremony. Memorial Sloan Kettering’s Academic Convocation recognizes and honors research as it is embodied in many individuals, including students who have earned their PhD degrees for work carried out in Memorial Sloan Kettering’s laboratories, younger Memorial Sloan Kettering physicians, scientists, and postdoctoral research fellows, as well as established clinicians and investigators from the Center and beyond. Through his intellect and drive, Joe had an enormous impact on the philosophy of the lab and on our research. His research focused on how proteins are transported from their site of synthesis in cells; he had great success in this work. The speaker to whom he referred was David J. Skorton, 12th president of Cornell University, who was awarded the Memorial Sloan Kettering Medal for Outstanding Contributions to Biomedical Research and delivered the Convocation address. A cardiologist, administrator, biomedical researcher, musician, national leader in research ethics, and advocate for the arts and humanities, Dr. Skorton has focused his research on congenital heart disease in adolescents and adults, cardiac imaging, and computer image processing. In his address, entitled Rediscovering the “Endless Frontier,” he called for a renewed national commitment to basic science research. JK's ability and intellect has now led an area of ligation chemistry — essentially, how you put broken ends of DNA back together — into lots of different arenas, and he is poised with skills that will allow him to lead in an area of his choice. The awards presented at Convocation to those within the Memorial Sloan Kettering community include the Frank Lappin Horsfall, Jr. Awards, which recognize outstanding research publications by graduate students; the Louise and Allston Boyer Young Investigator Awards in Clinical and Basic Research honoring Memorial Sloan Kettering physicians and scientists under the age of 40 who have demonstrated great promise and accomplishment in clinical and laboratory investigations; the Research Fellow Awards, which acknowledge the work of Sloan Kettering Institute postdoctoral fellows; the Willet F. Whitmore Award for Clinical Excellence, presented each year to a clinician whose talent and dedication reflect the standards set by Dr. Whitmore during his more than 46 years at the Center; and the Geoffrey Beene Graduate Fellowships, presented — for the first time this year — to two outstanding graduate students. Memorial Hospital Physician-in-Chief Robert Wittes (right) presented the Willet F. Whitmore Award for Clinical Excellence to Memorial Sloan Kettering medical oncologist Robert Motzer. This year, 16 students received their PhD degrees from Weill Graduate School of Medical Sciences, an academic partnership between the Weill Medical College of Cornell University and the Sloan Kettering Institute. Introduced by Dr. Varmus and Sloan Kettering Institute Director Thomas J. Kelly, the graduates and their research accomplishments were described by their faculty mentors. Justin's research focused on a class of molecule called spiroketals that are found in a variety of biologically natural products. He developed a brand-new approach to synthesizing these molecules and in the process discovered a truly novel chemical reaction. His molecules are now being tested against a wide range of biological targets. A reception for guests and honorees followed in the Laurance S. Rockefeller Board Room. Amy developed innovative approaches and models to test the model for how T cells develop in the thymus, and in so doing she proved that the model is wrong. Thanks to Amy, we're now on the right path. Harold Varmus congratulates the winners of the Geoffrey Beene Graduate Fellowships Hyung-song Nam (far left) and Sindy Escobar Alvarez.